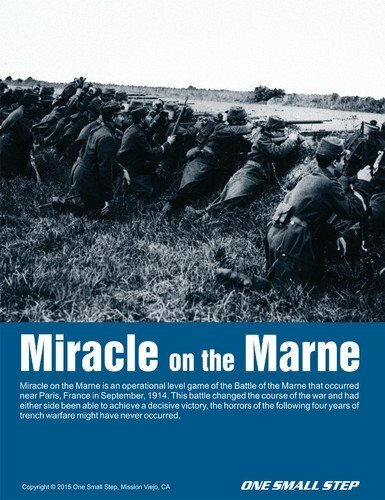 Miracle on the Marne is an operational level game of the Battle of the Marne that occurred near Paris, France in September, 1914. This battle changed the course of the war and had either side been able to achieve a decisive victory, the horrors of the following four years of trench warfare might have never occurred. In the game, one player or team of players, will control the Allies (France and Britain), while the opposing player or team will control the Central Powers (Germany). 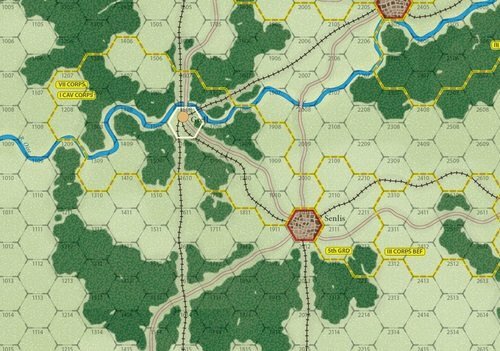 Each hex on the game map represents approximately fi fteen to twenty miles. Units represent brigades and divisions. A. Mutual Mode Alteration. Both players may change the mode of any HQ they choose, thereby altering the mode of subordinate units as well. This alteration is done by replacing the HQ unit currently on the map with another of the same designation, but with the new mode. HQ units are placed face down. Mode changing is done simultaneously. B. Initiative Determination Phase. Players roll the die to determine who has the initiative for the game turn. The player who rolls highest has the initiative and chooses whether he wishes to go fi rst or second during the turn. EXCEPTION: The German player has the initiative on the fi rst two turns of the game. 1. Movement Phase: The phasing player may move some, all, or none of his units, at his discretion. No unit may move further than its printed movement allowance. The player may also remove the effects of Disruption from eligible units and attempt recovery of eligible units. 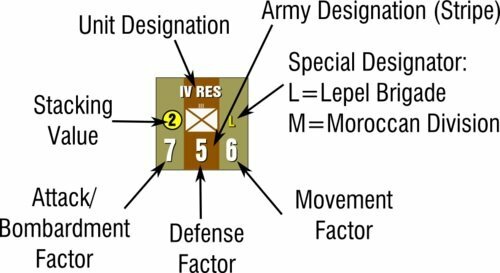 After all units have been moved, the phasing player may then bring on any reinforcements that are available and move them normally. 2. 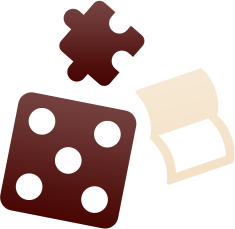 Bombardment Phase: The phasing player may now bombard enemy units with his artillery, resolving all Bombardment Combat on the Bombardment Table. a. Attacker Declaration Segment: The phasing player must identify all his units that will participate in this attack. b. Defense Fire Segment: The non-phasing player must declare and resolve all Defense Fire against the declared attackers. c. Attack Segment: The phasing player must now resolve his Regular Attacks using all surviving declared attacking units. d. Counter Attack Segment: The non-phasing player may declare and resolve any eligible Counter Attacks. D. Second Player Turn. The second player now becomes the phasing player and repeats steps 1 through 3. E. Supply Determination. Both players simultaneously determine if any units are Out of Supply.